Connor Schmid is entering his third year teaching at Divine Wisdom, where he will be an 8th grade homeroom and Social Studies teacher. Mr. Schmid completed his undergraduate studies at Binghamton University, with a double degree in History and Human Development. 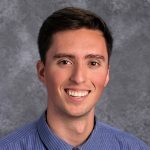 In 2016 Mr. Schmid finished his Master’s degree at St. John’s University, with a degree in Adolescent Education, with a concentration in Social Studies. For the past seven years Mr. Schmid has worked at The Waterfront Center in Oyster Bay, New York, teaching Marine Science programs to students from 1st grade through college.